TWTC is excited to share the progress of The Schools Recycling Project for 2014. A total weight of 660 000 kg was collected from schools in Port Elizabeth, Despatch, Uitenhage and Kirkwood for 2014 – 250 000 kg more than in 2013!!! The Schools Recycling Project currently has 180 schools that participate. “We have witnessed a steady growth in the project over the last few years. In 2012 we were collecting an average of 20 tons a month, whereas in 2014 we collected over 50 tons from schools every month. This year we are aiming to meet our target of 85 tons a month, which should be easily done as we have a lot of exciting new projects lined up to encourage our fellow citizens to recycle” – Vicky du Toit, marketing manager of The Waste Trade Company. The Schools Recycling Project kicked off this year by celebrating and awarding the top 3 recycling schools for the last term of 2014. In third place with a total of 6750kg for the term, was Sunridge Primary. 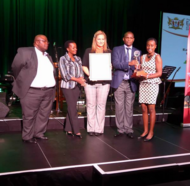 Kabega Primary is very quickly reaching celebrity status in the world of recycling, not only did they win second place for term 4, but they also won the Plastic SA competition for the second year in a row – earning the status of top PET recycling school in SA! BJ Mnyanda was a hub of excitement when TWTC arrived at the school to celebrate their first time as the top recycling school. Their new Principal, Mr S.C. Lukasi, has high aspirations for the learners - “We plan to use the prize money to invest in our leaders (prefects and Enviroclub) by purchasing badges for them, taking them on environmental excursions and organising a leadership camp”. TWTC and the winning schools would like to thank Mpact Recycling for sponsoring the cash prizes. Schools that would like to motivate their pupils to recycle can visit TWTC on their website or any of their other social media platforms, “Social media is soon to become one of the most powerful tools in reaching our schools project market segment, which are children. We are on Facebook, Pinterest and Instagram, where teachers and children can find, follow, tag and even share with us. We are researching various options in reaching our audience... look out for our competitions and fun activities this year!” - Vicky du Toit, Marketing Manager, TWTC.